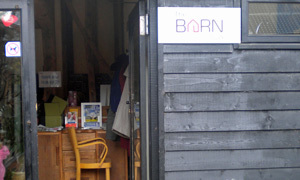 The Barn Cafe is part of Alder Carr Farm just outside Needham Market. It is housed in a partly beamed barn set in a very pleasant courtyard with little shops surrounding it and has seating for quite a few customers, a main area and another which is more compact. There are also tables and chairs in the courtyard itself for warmer weather, where plants are also on display for sale, so it all makes for a nice setting. I had heard that they have jacket potatoes, but on perusing the menu on the wall outside, there was no mention of these and we went back into the farm shop initially. Having another recce, we returned and went into the cafe this time and they are chalked up on a board inside, but they also offer soup and sandwiches if you are after a light lunch. We had Brie and bacon and chicken and herb mayo jackets which turned out to be very nice with salad. This place is not cheap but reading the comments notebook left thoughtfully on the table, it seems everybody liked the food. Tea to accompany, English for me and Earl Grey for Earl Broom which cost exactly the same, contradicting the price on the menu as Earl Grey is invariably dearer. Newspapers are available to while away the wait. The lady who served us was very polite and friendly and although we had no cake, of which there were several lovely looking ones, we gave the thumbs-up to the Barn Cafe.